Although grand rounds plays a major educational role at academic medical centers, there has been little investigation into the factors influencing the learners' decision to attend. Greater awareness of attendees' expectations may allow grand rounds planners to better accommodate the learners' perspective, potentially making continuing education activities more attractive and inviting. We used both qualitative (part A) and quantitative (part B) techniques to investigate the motivators and barriers to grand rounds attendance. Part A investigated contextual factors influencing attendance as expressed through attendee interviews. Transcripts of the interviews were analyzed using grounded theory techniques. We created a concept map linking key factors and their relationships. In part B we quantified the motivators and barriers identified during the initial interviews through a survey of the grand rounds audience. Sixteen persons voluntarily took part in the qualitative study (part A) by participating in one of seven group interview sessions. Of the 14 themes that emerged from these sessions, the most frequent factors motivating attendance involved competent practice and the need to know. All sessions discussed intellectual stimulation, social interaction, time constraints and convenience, licensure, content and format, and absence of cost for attending sessions. The 59 respondents to the survey (part B) identified clinically-useful topics (85%), continuing education credit (46%), cutting-edge research (27%), networking (22%), and refreshments (8%) as motivators and non-relevant topics (44%) and too busy to attend (56%) as barriers. Greater understanding of the consumers' perspective can allow planners to tailor the style, content, and logistics to make grand rounds more attractive and inviting. In William Ostler's era of the early 1900s, grand rounds was a bedside teaching tour led by master clinicians, and subsequently it has evolved into a lecture series[1, 2]. Grand rounds' styles reflect institutional tradition, and its themes and content reflect the perspective of the clinical departments. Competing time demands, convenience, relevance of topics, and speaker skills all can influence the decision whether or not potential attendees allocate time for grand rounds. Concerns about the ongoing relevance of grand rounds as reflected in attendance patterns have been studied in the United States, Canada, Australia, and New Zealand, and inferences have been made based on provider data or perceptions [6–12]. We wanted to explore, from the learner's perspective, the factors influencing the decision for attending grand rounds and compare those with the provider-identified objectives for grand rounds. A large fraction of the potential grand rounds audience chooses not to attend. According to one survey, nearly half of full-time and two-thirds of part-time department of medicine faculty missed more than half of grand rounds sessions, and more than 40 percent of departmental representatives perceived the popularity and attendance were decreasing. Successful attendance-building strategies include improving the understanding of attendance patterns, educational needs and preferences, the scheduling of notable or timely sessions, increasing attendance by residents and researchers, and increasing publicity. One proposed attendance-building strategy is to apply adult learning principles, which includes selecting meaningful and relevant topics. Greater knowledge of the details of the audience's decision-making process could reveal (1) more specific guidelines for what constitutes meaningful and relevant topics, (2) interrelationships between decision factors, and (3) the relative importance of specific decision-making factors. Grand rounds are expensive to produce, attract a large audience and providers perceive them to be of high quality[6–8, 10]. They can be an effective vehicle for information transfer, though sometimes the information disseminated may be conflicting or erroneous. Grand rounds as an educational event has been investigated primarily through multi-institutional surveys using questionnaires sent to planners, departmental chairs, and residency directors in the United States, Canada[6, 8], and Australia. According to these surveys, the purpose of grand rounds, from the providers' perspective, includes presenting research findings by departmental scholars, showcasing "stars" of the physician staff, updating diagnosis and treatment, educating faculty and house staff, and social interaction[6, 7]. We found no similar description of goals reflecting the audience's viewpoint. Furthermore, assessment of learners' needs and speaker evaluation may be inconsistently used for planning purposes[8, 10]. In the business model, success depends on satisfying customer needs, and marketing concepts reflect an understanding of the behaviors influencing purchasing decisions. In healthcare education where participation is voluntary and success depends on satisfying learner needs, a better understanding of the learners' considerations is a potential tool for increasing attendance. We used both qualitative and quantitative investigative techniques to identify and prioritize motivating factors and barriers for attendance. For part A of this study, we used interviews to qualitatively investigate the context of grand rounds in professional development. Qualitative research is better suited than quantitative methods for revealing the factors in the decision-making process itself because (1) the experience may vary among individuals and should be captured in their own words, (2) the process is fluid and dynamic and cannot be fully summarized on a single rating scale, and (3) the participants' perceptions are key to the process. We applied the grounded theory approach, which allows the theory to emerge from the data by using interviews to uncover (1) the factors affecting attendees' decisions to attend Pediatric Grand Rounds presentations, (2) the perceived desirable content and instructional characteristics for Pediatric Grand Rounds, and (3) how Pediatric Grand Rounds fits into the attendees' overall scheme of continuing professional development. Because qualitative analysis identifies factors but is unable to assign a relative weight, in part B we used an audience survey to quantitatively measure the relative importance of the motivating factors and barriers that had emerged during the first two interview sessions. The Pediatric Grand Rounds target audience consists of practicing academic medical center and community physicians, including general and specialty pediatricians, advanced practice nurses, residents, non-physician professionals, and medical students at a not-for-profit pediatric specialty hospital that is independently-owned but has extensive ties to the state university medical school. Of the 506 persons who attended one or more Pediatric Grand Rounds sessions during the period January 1 through December 31, 2002, 299 (59%) were physicians and 207 (41%) were non-physicians. In part A of this study, four groups of potential study subjects were recruited based upon actual attendance. Group 1 consisted of all 13 known retired physicians. Group 2 consisted of the 40 most-frequent academic medical center-based physician attendees and community-based physician attendees. Group 3 consisted of the 20 most frequent non-physician attendees. Group 4 consisted of 40 physicians who attended infrequently (2–5 sessions). Potential study subjects were sent personal letters inviting them to participate in a one-time group interview. We conducted a total of 7 one hour group interviews arranged to accommodate the participants' schedules. Each group consisted of 1–3 study subjects seated around a table or convened via conference call, while one or two of the authors (JD and GZ) acted as moderators. Participation was voluntary, and there were no inducements. Each interview group was asked to identify (1) the reasons for attending Pediatric Grand Rounds, (2) desirable features in Pediatric Grand Rounds, (3) factors motivating attendance, and (4) how Pediatric Grand Rounds fits into their personal continuing education and professional development. The group interview research project was approved by the University of Utah Institutional Review Board. The session transcript was distributed to each of the participants and corrected for accuracy and completeness. Sessions were concluded after the 7th group interview because no new themes had emerged. Line-by-line analysis was carried out to generate categories and relationships among categories and to discover their characteristics. A concept map was distributed to each of the participants to verify accuracy and completeness. The quantitative survey (part B) consisted of 2 multiple choice, multiple response questions that was part of an annual anonymous satisfaction questionnaire widely distributed by mail to 442 persons routinely receiving the monthly grand rounds calendar and was also available for pick-up on-site prior to each grand rounds session for 4 consecutive weeks during Spring 2002. With the exception these two study questions, the content and format of the annual questionnaire is unchanged from year-to-year. The response choices for the question, "What motivates you to attend grand rounds?" were continuing education credits needed for license, networking with colleagues, clinically/practically useful topics, cutting edge research, and refreshments. The response choices for the question, "What prevents you from attending grand rounds?" were topics not relevant to my practice, regularly scheduled meeting conflicts, busy schedule prevents me from getting away and child care issues. The response choices for the respondent's profession were academic/university pediatrician, community pediatrician, family practice physician, retired physician, fellow, resident, nurse practitioner, staff nurse, pharmacist, physician's assistant, student and other. All questions allowed additional free-form responses. These questions were not pilot tested prior to inclusion on the annual survey. There were no inducements for returning a completed survey. Sixteen persons [14 pediatricians (5 retired community generalists, 1 semi-retired pediatric specialist, 2 faculty specialists, 4 faculty generalists, and 2 community generalists) and 2 administrative pediatric nurses] took part in one of seven group interviews. All held active professional licenses. No one in the infrequent attendance group (physicians who attended 2–5 sessions) participated in any interview. All quotations are referenced by interview session number (I#). Panel discussions and presentations with multiple presenters were perceived as unattractive because they often lacked unity, or were not perceived as having sufficient depth. Some factors were uniquely important to certain groups. For retired physicians, the most important factors for attending were maintaining professional identity, the need for no-cost CME credit, and favorable weather conditions. Practicing pediatricians uniquely identified the need for current knowledge to teach residents. Retired and community pediatricians were the only groups to identify the importance of convenient parking. Free CME credit was an important motivator for all physician groups, but was mentioned most frequently by the group of retired physicians living on a fixed income. In contrast, continuing education credits were not important to the nurses because credits are not required for renewal of the state nursing license. All four professional groups (retired physicians, academic physicians, community physicians, and administrative nurses) use grand rounds as a venue for networking: professional relationships are maintained or renewed, messages to colleagues are related, brief consultations are carried out, and sub-specialists are identified for patient referral. Based on grounded theory analysis, we constructed a concept map (Figure 1) demonstrating the relationships among factors affecting grand rounds attendance. 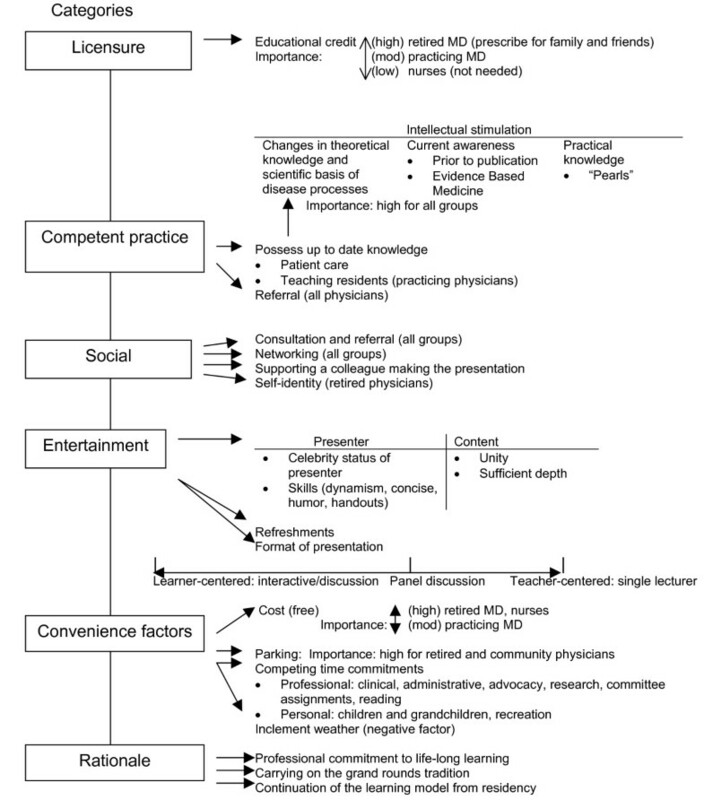 Concept map of factors affecting grand rounds attendance. Fifty-nine questionnaires (11.7% of those attending 1 or more session) were returned and categorized into 3 groups. Group 1 (academic medical center practice) consisted of academic medical center pediatricians and advanced practice nurses. Group 2 (community practice) consisted of community pediatricians, family practice physicians, and retired physicians. Group 3 (others) consisted of students, residents, fellows, physician assistants, staff nurses, and other hospital staff. Forty-two (71%) of the questionnaires had been picked up on-site. The results are demonstrated in Table 1. Ours is the first study to characterize motivations for attending grand rounds from the learners' – rather than from the planner's – viewpoint. The combination of qualitative (part A) and quantitative (part B) data allowed us to identify key factors and their relationships, as well as prioritize their relative importance. Clinical utility of the topic, being a competent practitioner, intellectual stimulation, social interaction, and entertainment were the most important motivators. Sometimes the boundaries were indistinct. This overlap can be explained by the inherently scientific nature of professional practice ingrained in physicians at all levels of training, from medical school through residency and fellowship. Achievement, curiosity, professionalism, CME credit, social interaction, and enjoyment are known motivators for self-directed learning[16, 17]. By its inherent design, this study emphasized the internal motivating factors, though the second most important factor was the external motivator of CME credit. All physicians, whether retired or in active practice, consistently cited keeping up-to-date as an integral component of professionalism. Up-to-date knowledge is a necessary, but not sufficient, condition for competence. This distinction was best exemplified by a group of retired physicians who expressed their desire to remain informed, but at this point in their careers, none of them claimed to be competent practitioners. Competency as a motivating force is consistent with Putnam and Campbell's view that that a physician's desire for competence is manifest in (1) striving to excel and be the "best" in the field, (2) willingness to change and innovate in clinical practice, and (3) willingness to respond to clinical problems. Cutting-edge research was a modest motivator for all groups, especially for those practicing outside of the academic medical center. All these factors contribute to the assessment of a topic's relevance. When the attendee judges the topic irrelevant, this negative perception becomes the second most important attendance barrier. The questionnaires, but not the interviews, identified scheduling conflicts as the greatest barrier for all groups. We speculate that selection bias best explains why scheduling conflicts were never identified during the interviews because frequent attendees had been generally successful in resolving such conflicts. Previously unidentified factors motivating learners to attend grand rounds are (1) striving for competent practice, (2) retired physicians maintaining their self-identity, (3) garnering non-cost continuing medical education credits, and (4) being entertained (beyond the perception of being an engaging speaker). The concurrence between the results of our study of learners vs. providers demonstrates that learners and administrative planners agree that grand rounds should (1) provide updates in diagnosis and treatment, (2) provide updates in medical research, (3) educate housestaff and faculty, and (4) facilitate clinical referrals. Both the administrative planners and learners recognize the role of grand rounds as a social event. Medicine department heads recognize the importance of grand rounds for promoting a collegial atmosphere which contributes to the sociological concept of "bridging capital" – the ability to transcend professional boundaries. Similarly, the subjects in our study used the grand rounds environment for networking opportunities (i.e. obtaining informal medical consultations, communicating messages to colleagues, and renewing social acquaintances). There are several limitations to this and previous studies. Previous reports based on multi-institutional questionnaires are unable to detect the more subtle factors which are obscured by audience heterogeneity[6–8, 10, 11]. A strength of our study is the homogeneity of our study population, allowing an in-depth probing of the decision-making process. However, because we studied only a single grand rounds series conducted at a single institution, our findings may not be universal and will need to be verified in other venues and specialty areas. This study's greatest limitation is the small number of volunteers for the interviews and respondents to the questionnaire. Since all volunteers for the interview were frequent attendees, the concept map may not adequately represent infrequent or non-attendees. The low response rate for the survey can result in an ascertainment bias. Furthermore, since the questionnaires were anonymous, we had no way to determine if respondents submitted multiple surveys. All of these factors could limit the validity of generalizing our findings to other audiences. Additional research is needed to determine if the factors we identified and the interrelationships outlined by the concept map are applicable to other types of audiences, other medical specialties, and other geographical regions. Despite their differing professional roles, all groups of grand rounds attendees valued clinically-useful topics, and identified intellectual stimulation, competence, continuing education credit for licensure, social interaction, entertainment value, and convenience as important motivating factors, though emphasis differed among the groups. Competing time demands, non-relevant topics, and inconveniences such as parking and inclement weather were the major negative motivating factors. Because of our research, we now ask presenters to design their grand rounds presentations so that the instructional content contains a mixture of current science and practical application and targeted to the level of the generalist. As consumers of educational products, busy healthcare providers make choices among competing alternatives for their time. By recognizing these key decision factors, planners can potentially increase grand rounds attendance by structuring the style, content, and logistics to better accommodate the learners' perspective. The authors thank Cameron Dolcourt for technical editing. JLD conceived and designed the study, obtained IRB approval, developed the interview and survey questions, recruited participants, participated in the subject interviews, coded transcripts, and drafted the manuscript. GZ participated in the design of the study, participated in the subject interviews and helped to draft the manuscript. KW participated in the subject interviews and helped to draft the manuscript. All authors read and approved the final manuscript.